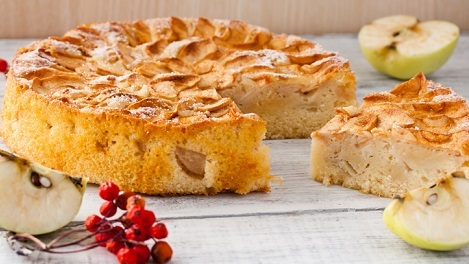 Enjoy this delicious apple cake recipe from the recipe collection of Sue Rodman. First, peel and cut five or six apples in square chunks about the size of a thimble. Sprinkle in 2 teaspoons of cinnamon and 5 tablespoons of sugar and set aside. Beat these together until mixed and pour half this batter into a greased and floured Turk’s Head pan, then spoon half the apples into the pan. Top with the remainder of the batter and put the rest of the apples on top. Place in preheated 350-degree oven and bake for about 1.5 hours until done. When it’s done, the cake should be a golden-brown color. Remove it from the pan and let it stand on a rack to cool. Enjoy!